Animated weather conditions. Tap center of hands to make them temporarily disappear. TAP 9 to cycle through 4 levels of additional dark filters. 4th Tap is complete darkness Theater Mode. Tap 6 oclock for ambient options. Tap 7 and 11 to scroll through Ucolor options. Tap 3 to scroll through Weather, Steps and Chrono. Tap start/reset for chrono. 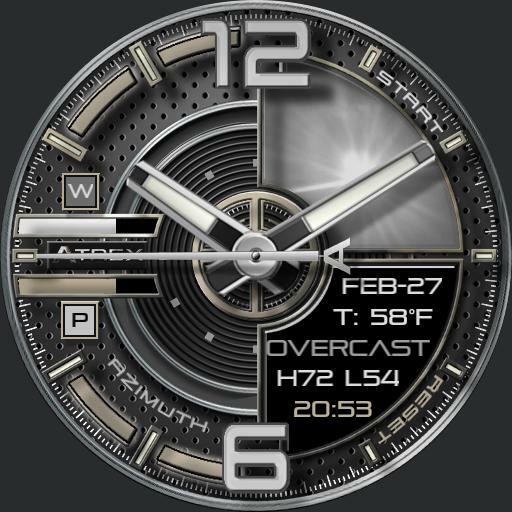 Shows temperature, hi/lo temp, last update time, conditions, date, phone and watch battery level. Tap weather image for update.